New Delhi, Feb 1 : Harping on Indias aspiration to become a $10 trillion economy in the next decade, Finance Minister Piyush Goyal laid out the 10 "most importunate dimensions" of the Modi governments "Vision 2030". 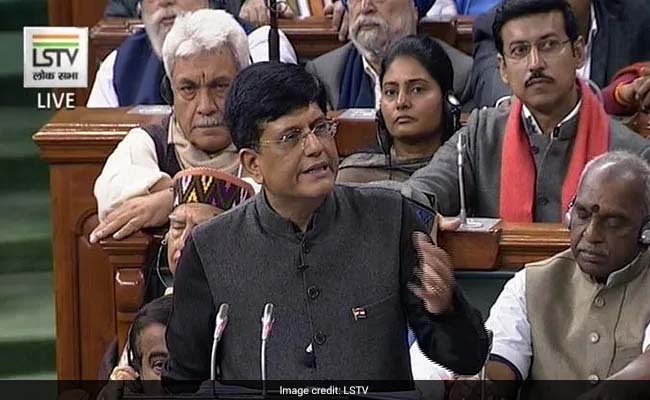 While presenting the Interim Budget 2019-20 in the Lok Sabha, Goyal said the dimensions will pave the way for the country to turn into a modern, high-growth and transparent society. Goyal said building next generation infrastructure in all sectors comprising roads, railways, seaports, airports and inland waterways is the first dimension to provide an "ease of living". The second is to build a "Digital India" that reached every corner of the economy and every citizen. Clean and Green India is the third dimension - "an India that drives electric vehicles, with renewables becoming major source of energy, bringing down import dependence and increasing energy security for our people", the Minister said. The fourth dimension he listed was expanding rural industrialization using modern industrial technologies, based on the 'Make In India' approach, using grassroot MSMEs and startups across the country. "India is now on its way to becoming a global manufacturing hub in many sectors." The fifth dimension, he said, was "Clean Rivers", with safe drinking water to all Indians using micro-irrigation techniques. "Oceans and coastlines" is the sixth dimension followed by the seventh, which is "India becoming a launchpad of the world by placing an Indian astronaut in space by 2022". The eighth dimension is "self-sufficiency in food and improving agricultural productivity with emphasis on organic food". He listed "Minimum Government, Maximum Governance" as the 10th dimension, with proactive, responsible, friendly bureaucracy and electronic governance.